South Africa captain Graeme Smith feels his side can improve further after their series win over England lifted them to number one in the International Cricket Council rankings. "Being number one is something we've pushed for, for a while," said Smith. "We've achieved where we wanted to go, but we want to carry on. "The challenge is the same for us as it was for England - to build a strong enough base that when the wind blows, it doesn't blow us over." Smith, who broke Allan Border's record by leading a Test side for the 94th time in South Africa's 51-run victory at Lord's, which sealed a 2-0 series win, added: "Hopefully we can maintain these standards for some time. "There are a lot of good teams around at the moment - Australia is the next challenge for the Test team, we've got a formidable squad here but we need a good depth of players, such as fast bowlers. "Touch wood, we don't have any injuries, but we need to have players that can come and perform at the same level. "That's the crucial aspect of maintaining this ranking, and there's a hope and belief that we can carry it on. "Having had it before, we've learned some lessons. Our feet will be firmly on the ground, and if we lose the ranking it won't be from it not sitting well with us, it'll be because someone has played better than us." Reflecting on the whole series, he added: "We've been here a long time, and to maintain that standard of performance from the first warm-up game to now is a great achievement from the management and the players. "England were number one in the world, they performed well in Australia, and although they struggled against Pakistan and on the sub-continent, in their own conditions they're an outstanding team. "For us to beat them here is one of the greatest achievements of my career, and I'm proud of each guy as there were contributions from across the board, it wasn't just one or two individuals - everyone stepped up when they needed to. "In this game, Hashim Amla's hundred was outstanding but the tail-end partnerships, the efforts with the ball and the catching were great. "I think all of us wished it had been a four or five-match series, we've been here two months so I think we could have fitted in another Test. "We'd like to play more Test cricket, and be good ambassadors for Test cricket." Batsman Amla, named as South Africa's man of the series, said: "It's been an amazing Test match - England had to come out and play as a draw wasn't going to help their cause. "The low-scoring nature of the game meant that the small partnerships mattered a lot. 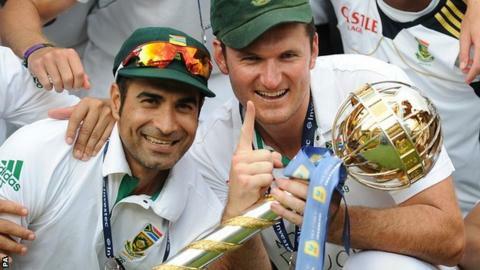 "We had a few moments of drama but we held our nerve and the way Vernon Philander [who took 5-30] bowled was incredible. "This series has been phenomenal, but I hope there's better to come from us, as we're a team that's growing and there are some big challenges to come." On his own progress up the ICC rankings, he added: "I have come a long way to be the number two-ranked batsman in the world, but I don't think I am even the second best batsman in my team so I don't know how they work that one out!" Listen to Jonathan Agnew and Geoff Boycott review each day's play on the Test Match Special Podcast.